Playtech is on the verge of creating a brand new series of slot machine games. If you loved the old Marvel Mystery Progressive Jackpot slots, you’re going to be out of luck. They are set to be cruelly taken from you in the coming months. Not to fret, though, Playtech has been developing a range of DC/Warner Bros themed slots to replace them. Expect all of your favourite DC heroes to make an appearance eventually; but for now, we’ll have to settle for Batman and The Joker. The new Batman and Joker: Joker Jewels slot is hardly bad news, though. This new slot may have a different paint job, but underneath it offers the same setup, structure and gameplay you’ve come to know and love from the Marvel Mystery Progressive Jackpot slots. The new Batman and Joker: Joker Jewels video slot is predicted to be just one of several new slot machines to be released by Playtech. This new series has already got a Batman and Catwoman: Cash Slot on the way, so this will be the second (or the first, depending on which way you want to look at it) release in the new DC/Warner Bros line of slots. Playtech has tried to keep things familiar with this game, and that is certainly going to make it appeal to lovers of their Marvel slot games. Located below the reels of this slot is the wagering menu bar, which does not allow you to alter the number of lines. It is nicely designed, and you can choose line bets which range from $0.25 per spin, up to $500 per spin. This 5-reel, 25-line slot does still have a lot to offer you in terms of flexibility of wagers, and should be suitable for players operating on all sorts of budgets. Wild symbols: You can actually prosper from two wild symbols in the slot. They appear as the Joker smiley face, and the Batman logo. Both wilds come into their own in the free spins feature, but both are capable of substituting for all other icons in the game, barring each other and scatters, of course. Scatter symbols: The green bonus icon will trigger a free spins feature, but you will need to land 3 of them on the first, third, and fifth reels of the slot to bag the bonus. Once the feature is triggered, players will also pocket scattered wins. Free spins feature: We mentioned that there were two types of wilds which are most prevalent during this feature. Before they can be, you need to choose whether you wish to play the bonus round as The Joker, or Batman. During the feature, any wilds related to your character will boost the Bat-Tastic Multiplier Meter, whilst wilds associated with the other character will lower it. You will keep bagging free spins (and multipliers) until the Bat-tastic Meter reaches “end”. Joker random wilds: Players can also prosper from a randomly triggered Joker feature in the game. At any point, up to 9 smiley wild symbols can appear on the reels, courtesy of The Joker. This is a progressive jackpot slot, just like all of the Marvel themed slots which came before it, and just like the other Batman themed slot being released by Playtech (Batman and Catwoman: Cash Slot). Players can win one of four progressives (Mini, Minor, Major, and Grand) at random in this slot. Once the progressive jackpot bonus round begins, players can select from a number of icons on the screen to try and match 3 identical progressive prize symbols. The symbols they match denote the progressive jackpot that will be paid out to the player. If you can’t get your hands on a big progressive jackpot prize, the wild symbols are the next best paying symbols in the slot. Five on a line will see you landing a more than decent compensation prize, which is non-progressive in nature. Batman and Catwoman: Cash Slot contains more features than this title, and it offers more in terms of excitement. 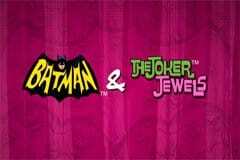 We don’t want to take anything away from Batman and Joker: Joker Jewels, though. This slot is just as friendly and action-packed as any of the Marvel themed slots which came before it. We happen to think that Batman and Joker: Joker Jewels make for a rather nice introduction to the franchise in the online casino world, and we’re sure that you will agree.